The cold-water version uses a ratio of one part flour and one to three parts water. You’ll need to test the ratio yourself until you get the consistency of thick glue. About.com recommends adding a few tablespoons of salt to the mixture to help prevent mold, but we couldn’t find confirmation on this. In any case, you can’t beat wheat paste as an inexpensive, fast, and kid-friendly craft tool. 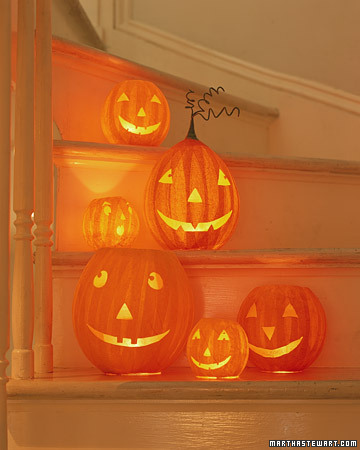 The reason the faces looks like they were only cut out of the orange layers, was because once the faces were cut into thee pumpkins – through all layers, they added another layer of yellow tissue paper to the inside of the pumpkin, for the light to shine through it. It would also help stabilize the pumpkin a little more. ← A bit of Free Printable Halloween Goodness!